Last year, I contributed an essay to the programme of the NoirCon crime fiction convention, which is held in the USA every two years and celebrates dark crime fiction. The topic of the essay was the rise of hard-hitting, gritty British crime writers, such as Allan Guthrie, Tony Black, Charlie Williamsand Ray Banks. The title of the essay was Brit Grit. Earlier this year,Trestle Press published my first short story and flash fiction sampler and I decided to call it Brit Grit. 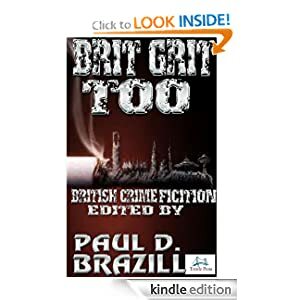 After realising that there were more and more British writers of gritty crime fiction out there, many of who were unpublished, I l decided to try to put together an anthology of Brit Grit writers. The BRIT GRIT mob is coming to kick down your door with hobnailed boots. Kitchen-sink noir; petty-thief-louts; lives of quiet desperation; sharp, blood-stained slices of life; booze-sodden brawls from the bottom of the barrel and comedy that’s as black as it’s bitter–this is BRIT GRIT !! !